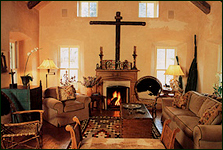 Jack Parsons - "Santa Fe Style"
"Santa Fe Houses" reunites Jack Parsons and Christine Mather, the partnership which created the genre-founding bestseller "Santa Fe Style". This time, they take a look at both what has endured and what has changed about being at home in one of the Americas’ most influential locales. 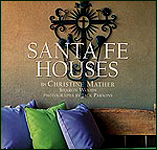 The book explores Santa Fe homes in sections named for their design inspirations: Earth, Fire, Water and Air. It also focuses on beautiful Native American, ethnic, devotional and garden art. 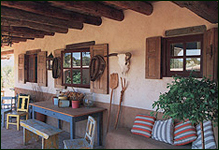 This captivating tour takes the viewer into some of the most beautiful homes in the Southwest. Saturated in the brilliant light of the high desert, their architecture and decor are inspired by age-old materials and extraordinary cultural riches not to mention a landscape unmatched anywhere else in the world. The book even features a directory of home and historic preservation specialists.